Medical equipment delivered by YAD amids the Ebola outbreak[/caption]Youth in Action for Development (YAD) in collaboration with its German partner, Fambul Tik e.V., has donated medical equipment to two Peripheral Health Units (PHUs) at Yarbaima town in Langurama chiefdom and Blama town in the Small Bo chiefdom in Kenema district. The items donated include hospital beds, mattresses, examination stretchers,X-Ray Extractor and cartoons of bacterial disinfectant. 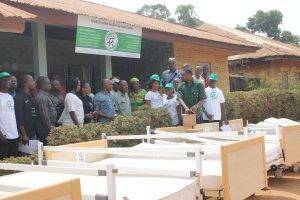 The presentation ceremony which attracted hundreds of participants including several stakeholders of Kenema district, took place at YAD’s Multipurpose Youth Resource Center, 16 Duawoh Street in Kenema city. In her opening statement, the chairperson of the ceremony who also doubled as a member of the Social Mobilization Committee of the Kenema District Health Management Team (DHMT), Elizabeth Jamie Bockarie described the ceremony as historic not only in the life of residents of the two chiefdoms but the nation as a whole. 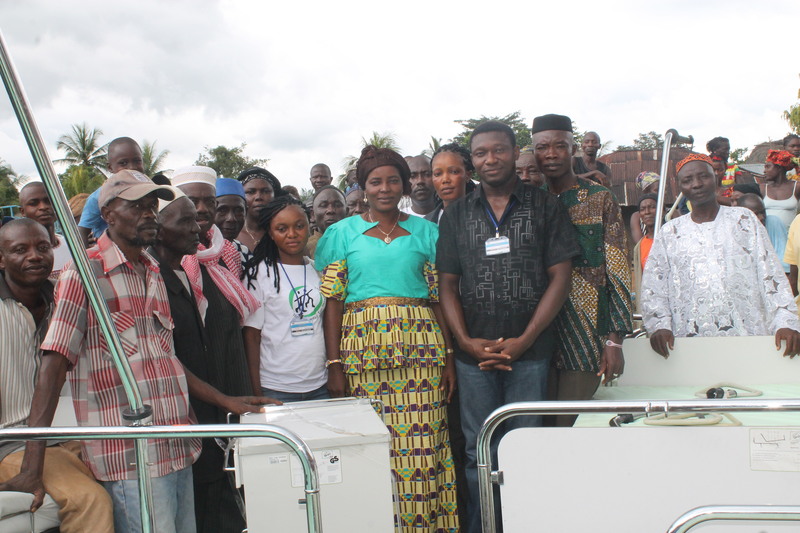 She said YAD is a household name in Kenema district due to its developmental activities in the district. She said with the existence of YAD in the district, most youths have been reformed from bad to good activities in the society, and called on other youth groups to emulate the good example of YAD. Delivering her statement on behalf of the Kenema City Council (KCC), the Deputy Mayor Esther Guanya Kaisamba assured all of the Council’s continuous support for YAD and any group that stands to implement developmental projects in communities across the district. She called on the youths to embark on developmental projects in their communities such as road maintenance among others. She appealed to the youth to do everything possible to make good use of the opportunity exposed to them by YAD. Formally presenting the items to the District Health Sister for the attention of the two beneficial PHUs, the Programme Coordinator, Othman Sheriff disclosed that the items were donated by Hedwigshohe Hospital in Berlin, Germany and the transportation to Sierra Leone was co-funded by the German Federal Ministry of Economic Cooperation and Development (BMZ), Fambul Tik e.V. and YAD. He maintained that during the Ebola outbreak in the country, YAD delivered 39 hospital beds, mattresses and palettes of other medical products to the District Health Management Team (DHMT) at the Government Hospital in Kenema and various Peripheral Health Units at Gandorhun, Sendumei, Bandowor and Ngiehun Konjo towns in Niawa and Malegohun chiefdoms respectively. He said YAD is a youth organization working with the youth and for the youth, women and children and that its areas of intervention include education, governance and peacebuilding, agriculture and food security, skill and livelihood training, social mobilization and sports. In the area of social entrepreneurship, the organization is currently embarking on Information and Communication (ICT) training, digital photo production, desktop publishing, digital library services among others. He called on the youths to remain focus at all times and to make judicious use of the opportunity exposed to them. He appealed to the relevant stakeholders in the two chiefdoms to do everything possible in ensuring the proper use of the items for the benefit of all and sundries. He said his dream is to ensure that YAD cover the fourteen districts of the nation. Receiving the items on behalf of the District Medical Officer (DMO) Mohamed Vandi for the attention of the various PHUs, the District Health Sister Mrs Josephine Saidu thanked YAD for its intervention and described the donation as a laudable venture in the health sector of the nation. Adding that it will not only benefit those of constituency 017 in Kenema district but the entire district. She said YAD is giving life to the people of the two chiefdoms owing to the fact that health is wealth. She further called on the beneficiaries to pray God for the benefactors and its donors and called on the donor to do more as more chiefdoms in the district are yet to benefit from such gesture. The Hon. Paramount chief Prince Mambu Pewa of Langurama chiefdom on behalf of his colleague chiefs of constituency 017 thanked YAD and Fambul Tik for their continuous supports in their communities, saying it is an indelible ink in their minds as custodians of the land and that they will continue blessing the Project Coordinator, Othman Sheriff as true son of the land and all philanthropists who provided those items. Delivering vote of thanks on behalf of the beneficiary communities, staff of YAD and all youth groups who participated in the occasion, the Finance Officer, Isata Ngombulango thanked the guest for participation and promised the stakeholders that the management and staff of YAD shall ever continue working 24/7 to provide the needs of the needy people in Kenema district. She further underscored that YAD is a training ground for every ambitious youth and that every suggestion, idea or advice that can take the organization to a higher height would be taken into consideration. In another development, the organizations brought smiles into the faces of more than 200 female and youth headed households in Matakan village, Niawa Chiefdom over the weekend as they delivered to them more than 200 packets of used clothing and shoes donated by philanthropic friends in the Federal Republic of Germany.